All images by Robin Goldsmith. Contrary to popular rumour, the manufacturing industry is not dead and there's one example that's seen tangible success on both sides of the Atlantic and beyond. It's called brewing and it just happens to be highly innovative, forward looking and full of surprises. Saisons and sours versus porters and stouts may lie at different ends of the brewing spectrum, but they do share something in common: a quest for flavour and taste bud-tingling originality that sets artisan beers apart from the run-of-the-mill big business bland boredom brews. And so it was that I spent a joyous Friday afternoon and evening at Craft Beer Rising in London, a celebration of modern brewing, which I also wrote about last March for The Alcohol Professor. This year, alongside the fabulous beer, there was a separate area, 'Cyder Space', devoted to another increasingly popular drink, cider. Additionally, mead and wine were available, along with a wide range of street food, all set within the party-style vibe at The Old Truman Brewery in London's Brick Lane. With 150 exhibitors, the first conundrum was where to start, but this was swiftly solved when my eyes settled on Keltek. The family-owned Cornish brewery has garnered much praise from trade and consumers for its range of hand-brewed ales, made traditionally using whole hop flowers, British malts and hand-pitched yeast. However, here I was particularly interested in their Swifties Cornish Lager, available on draught and in bottle. With craft ales being so successful, several UK breweries are turning their attention to craft lagers too. At 4% ABV, this is relatively light, but has enough flavour to appeal to all beer lovers. It combines the cleanness of lager with a malty ale-like flavour, worlds away from the ubiquitous, tasteless fizzy offerings to which we have become all too accustomed. Similarly, Keltek's Lance Golden Ale, which I also enjoyed, is a light sessionable beer with citrus fruit and smooth malt notes, a perfect beer for lager drinkers wanting to try craft ale. In a sea of key and nitro keg, Bristol's Butcombe, established in 1978, continues to stick to its guns with 60% cask production, producing great-tasting beer in a variety of guises. Haka (4.5% ABV) is a full-flavoured, light golden ale, made with New Zealand hops and brimming with tropical fruit aromas and flavours, alongside a zingy citrus character. If you like hoppy beers, then this one is for you. 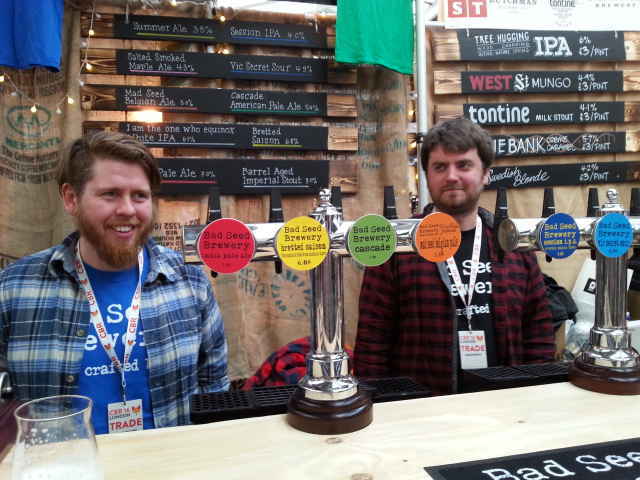 Bad Seed Brewery from North Yorkshire was another of my star finds from the 2015 event and this time round, there was again no shortage of innovative beers to try at the brewery's stand. Starting off with the Summer Ale (3.8%ABV), brewed with an Australian hop of the same name, this refreshing and floral beer showed notes of apricot and citrus. Other beers, such as the IPA (7%ABV) and barrel-aged Imperial Stout (8% ABV) were fuller bodied, rich and very different, the latter having spent six months in whisky barrels giving a real whisky hit on the palate. This would be great with cheese at the end of dinner. Another intriguing beer was I Am The One Who Equinox (6.2% ABV), a white IPA, hopped in the kettle with Sorachi Ace and Columbus and then dry hopped with Equinox. Although the Sorachi hops give a subtle lemon zing to this beer, there is a definite tropical fruit and coconut character here – almost like a Piña Colada with some tangerine and other citrus thrown into the cocktail mix! All their beers are original, tasty and definitely worth trying, from the unfined and unfiltered Salted Smoked Maple Ale (4.3% ABV), Mad Seed Belgian Pale (5% ABV), brewed with orange and rosemary and the Bretted Saison (6.8% ABV) which spent 6 months ageing in barrels with two strains of Brett. If beers can put a groove in your step, then Bad Seed certainly provides the funk! Beavertown has been causing a hop-filled storm of late by winning awards for its innovative beers and branding. Founded in 2011 in a pub basement, Beavertown is one of London's star breweries and one of the first micro-canners in the capital. Blueberry Muffin Phantom (4.5% ABV) is the company's take on a Berliner Weisse. 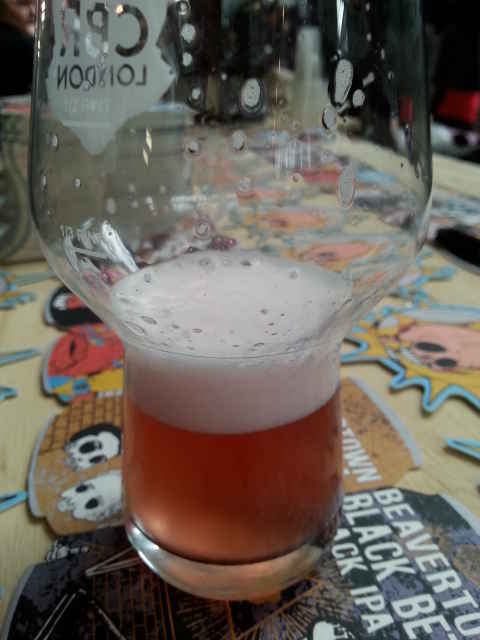 Lactobacillus bacteria sours the beer naturally in the kettle and whole blueberries are added towards the end of fermentation, resulting in a floral, fruity, sweet and sour, tangy beer with a dry finish. Neck Oil Session IPA (4.3% ABV) is a hugely drinkable beer made with eight varieties of hops, showing that IPAs do not need to whack you with high degrees of alcohol to offer good flavour, reflecting a growing trend for lower ABV 'session IPAS'. However, the beer that did knock my socks off was 'Spresso Imperial Stout (9.5% ABV), a collaboration with Caravan Coffee Roasters. A two-stage brewing process involving the addition of roasted coffee beans plus nine months ageing in whisky barrels creates this power-packed brew with upfront, roasted, bittersweet coffee notes and a treacle/molasses-style richness. This is a very smooth beer and one to try at the end of a meal with a decadent chocolate pudding! South London's London Beer Factory is a craft brewery founded by two brothers in early 2014. The company has a 'Core Range' of five beers, which are all unpasteurised and unfiltered. Additionally, they have a 'Pilot Range' that represents the more experimental side of the brewery, allowing them to produce what they call "one-off wild and whacky beers". Chelsea Blonde (4.3% ABV) was their first beer and remains a delicious mélange of English malts and American hops resulting in a floral, fruity, citrus-tinged beer with good flavour. The company is a fan of 'dry hopping', the technique which involves adding hops after fermentation to incorporate delicate aromatic oils otherwise lost in the boiling process. The dry hops soak in the beer at a low temperature for days or weeks, providing a characteristic hit of floral, hoppy aromas and flavours, but without bitterness. Paxton IPA (5.5% ABV) is one such beer, which the company describes as a 'hard hitting, fully hopped IPA' and it certainly doesn’t disappoint! The brewery will soon be launching its entire beer range in cans with completely removable lids to accentuate aromas and flavours, similar to drinking from a glass. London microbrewery Hammerton dates back to 1868, but was revived in 2014 after having been demolished many years previously. They are probably best known for Pentonville Oyster Stout (5.3% ABV), having been the first brewery in the world in 1938 to use oysters as part of the brewing process to add an extra level of flavour. The current recipe results in a stout with hints of chocolate, coffee and caramel biscuit plus a saline edge on the finish. Their Baron H Earl Grey Black IPA (5.8% ABV) was brewed especially for the company's first anniversary. It's been dry hopped with six different hops before a good amount of Earl Grey tea leaves are added to the fermentation tank to infuse. It's a lovely beer with a complex array of aromas and flavours, including malt, grapefruit, spice and bergamot plus a long finish. Sours and Saisons are certainly catching on in the UK and an increasing number of home-grown breweries are making these beers with a British twist and a nod to local heritage. Indeed, in addition to the widespread use of international hops, themes that kept recurring in this celebration of beer were expressions of classic European styles, such as Berliner Weisse, as well as US-inspired brews. Old Kent Road is more than a square on the Monopoly Board – it's also the name of an innovative London brewery. Astoria Saison (5.6% ABV) is based on the classic Belgian style and is named after a 1930s theatre. There's a big citrus hit here plus a touch of spice too. In contrast, Asylum Black (6.2% ABV), named after a ruined chapel which used to be a retirement home for pub landlords, is a dark, rich, malty beer with late-addition US hops adding complexity. I'll definitely be watching out for new brews from this impressive debutante at Craft Beer Rising. Switching to the North-East of England now, Tyne Bank is another brewery espousing innovative combinations of British and international themes. With a core range of five ales, their monthly specials are inspired by a variety of global beer styles. Additionally, they brew seasonal ales and it was one of these that grabbed my attention with its veritable "does what it says on the tin" label! Crème Caramel (5.7% ABV) was their Christmas special and contains Maris Otter, crystal and chocolate malts plus a large amount of caramalt to give a complex, deep toffee flavour. Demerara sugar is then added to the brew, but it's the non-fermented lactose sugar and Madagascan vanilla which really impart the sweet creamy custard aroma and flavour to this comforting brew. Core beers, such as Dark Brown Ale and other specials, such as Rhubarb and Custard Oatmeal Pale Ale, Chocolate Raspberry Stout, West Coast IPA (with hops grown in in the North Western states of the US), Vienna Lager and Farmhouse Saison go some way to showing what this exciting brewery is all about. Milk stout is a British beer style with an unusual and interesting history. Derived from the common practice in the 1700s and 1800s of blending milk and beer, by the mid-twentieth century, lactose, which is unfermentable milk sugar, was used instead to provide a silky creaminess and sweetness. 'Milk beers' had been touted as restorative and healthy, even being prescribed by doctors to pregnant and breastfeeding mothers, which eventually led the British government to ban the term milk stout due to unproven claims and to protect children. Fast forward to today and the style is regaining popularity. "Are you old enough to be unconventional?" 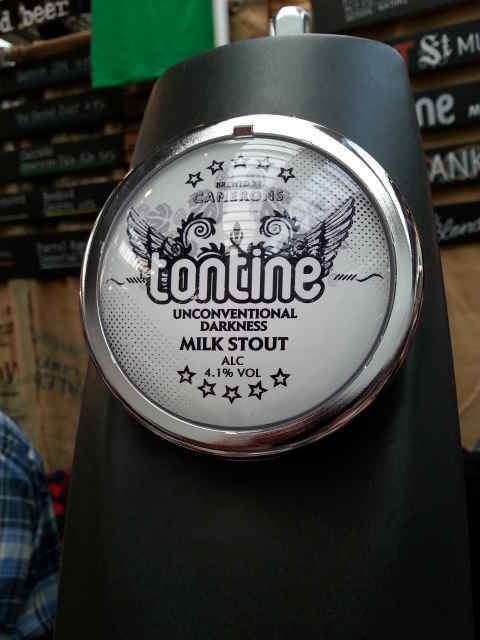 is the tag line for Tontine Stout (4.1% ABV), a new beer brewed by Camerons at the Lion Brewery in Hartlepool. Named after an outlawed and therefore 'unconventionally dark' 17th to 19th centuries' method of raising investment capital, it is the product of extensive research into the stout market to see what style new consumers preferred. The result is a milk stout with a velvety smooth mouthfeel, gentle roasted malt, chocolate and coffee flavours plus a sweet finish with just a subtle hint of hop-driven bitterness. The event was not restricted to UK breweries and it was good to meet up again with Italian craft brewer, Birrificio Indipendente Elav who I interviewed last year for The Alcohol Professor. Beer bottles showing an impressive array of artistic designs adorned their counter and it was a pleasure to enjoy some of their beers once again. However, it would have been hard to miss the colourfully dressed guys from Riojan craft brewery Little Bichos, part of Mateo & Bernabé. 'Bichos' means bugs, insects or small animals in Spanish, which is why all the labels have animal pictures, e.g. a spider, moth etc.. The wine connection can be felt in their beers, such as the IPA PX, a 7% ABV delight which has been aged for several months in used and very old Pedro Ximénez barrels. My favourite of their range, perhaps because it was so completely unusual, was Spanish Cake Brown Ale (5.0% ABV). Brewed with Trenza, a time-honoured Spanish rum and raisin pastry cake, this unsurprisingly had a succulent, dried fruit character and was utterly delicious. The name Hoxton is synonymous with über-trendy London street food, cocktail and craft beer bars, but Hoxton Cidersmiths are devoted to the art of developing great tasting craft cider. Their Benchmark range, created with renowned Somerset cider maker, David Sheppy, ticks the right boxes, being flavourful and easily quaffable. For example, the oak-aged SixpointSix (6.6% ABV) is full of appley goodness with an edge of vanilla creaminess softening the acidity. Worley's Cider uses the finest vintage cider apple varieties from South Somerset, blending up to 16 different ones, to create still and slightly sparkling ciders. Their Special Reserve Medium English Keeved Cider (5.4% ABV) is a top quality example of the ancient art of keeving. This involves allowing the juice to ferment slowly over several months to create a naturally medium sweet, full and fruity, lightly sparkling cider. Originating in France, the method was first practised in England in the mid-1600′s, but has mostly been replaced these days by large-scale industrial processes. Worley's version is beautifully aromatic and full of fruit with a touch of caramel and mellow tannins. Fynburys is a young company from Rutland, England's smallest county which measures just 18 miles (North to South) and 17 miles (East to West) at its longest points in the East Midlands of the country. They only select apples from Rutland or the surrounding counties and make their cider naturally without additives. Their range comprises four ciders, including a unique Rhubarb and Strawberry flavour (4% ABV), these two early-summer fruits combining perfectly with the apples to provide an additional layer of natural fruity sweetness and sharpness. Having satisfied my hunger pangs with stopovers at some of the street food stalls, including the terrific Orso Italian Street Food and Moons Green Charcuterie, it was time to try another traditional drink. Mead is the world's oldest known alcoholic drink, made essentially from fermented honey and water. Linked via myth and legend to ancient cultures around the world, it has been gaining popularity more recently through the 'Game of Thrones' effect. Mabinogion Mead from Wales is an ethically focused company that uses Welsh honey bought at a fairtrade price from local bee-keepers, helping to protect the decline in the bee population. Using their own bespoke mead fermenters, they also have bulk tanks with spice traps and Burgundy barrels in which they can age different mead styles. Cyser is a version of mead, made by fermenting a blend of honey and apple juice. Transformation to Eagle (15% ABV) is a smooth, sweet aged cyser, rested in cinnamon and myrtle pepper for a delicately elegant spicy finish. Mab Mead's founder, Tom Newman, was inspired by the US mead scene, which led to the world's first craft mead collaboration, between the Welsh company and Superstition Meadery from Arizona. The Hounds of Annwn (9.4% ABV), named after the spectral hounds of Welsh mythology whose howling foretold death to all those who heard it, is a delicious mead made with fresh strawberries and honey and aged with spice and Madagascar bourbon vanilla beans. Among the range of meads below 8% ABV, The Truth Bee Brew (5.3% ABV) is a lovely example of a delicately sweet and refreshingly tart, easy-drinking style, flavoured with sour cherries which are added after the primary fermentation. Boxed wine at a beer event? Although many people will still turn their noses up at bag-in-box wines, standards have improved hugely and there is definitely a growing market for this. Environmentally they're good, financially they make sense and for events they're ideal. Additionally, although they have a limited shelf life, once opened they can be kept for several weeks. So it was no real surprise to see some examples at Craft Beer Rising, a true haven for adventurous, enlightened and very happy drinkers. More Wine is a market leader in the supply of quality wine on tap. All of their wines are low-intervention, made with consideration for the environment and many are certified organic, biodynamic or considered to be ‘natural’. With my interest piqued, I took the opportunity to try wines from two of their brands. boxed wine at a beer tasting! Le Grappin makes wines from overlooked and under-appreciated vineyards in Burgundy and Beaujolais, earning accolades for winemakers Andrew and Emma Nielsen. Their Du Grappin range of vins de soif are made by hand, from locally sourced grapes, in their ancient winery in Beaune. Available in refillable bottles, kegs and 1.5 litre bags, they are particularly good for summer festivals. The bags, called Bagnums, offer triple-lined protection against oxygen transfer, can reduce carbon footprint by up to 80% and do not disappoint on taste. One example is the Chardonnay, made from 25 year old vines and which has spent a bit of time in oak. It's crisp, floral, fruity and rather moreish! Vinnaturo sources wines made by small-scale organic or biodynamic growers in France, Spain and Italy. 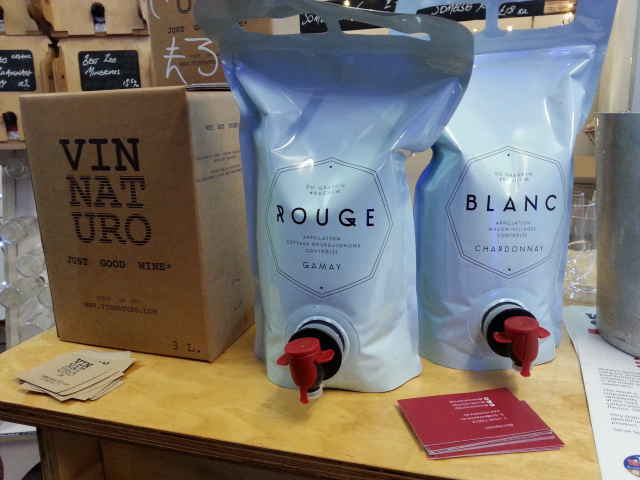 Their 3-litre bag-in-box selection includes fresh and fruity wines from Sangiovese, Tempranillo, Sauvignon Blanc, Trebbiano and Macabeo/Airén.